Samurai swords are well known as some of the strongest and sharpest swords ever made. And it’s HOW they’re made that makes them so special. These incredible swords are forged using a process that involves heating the steel in a furnace that reaches temperatures close to 2,000 degrees Fahrenheit, then striking the steel with a hammer and folding it back on itself. Then it goes back in the fire, and the process repeats itself over and over again. 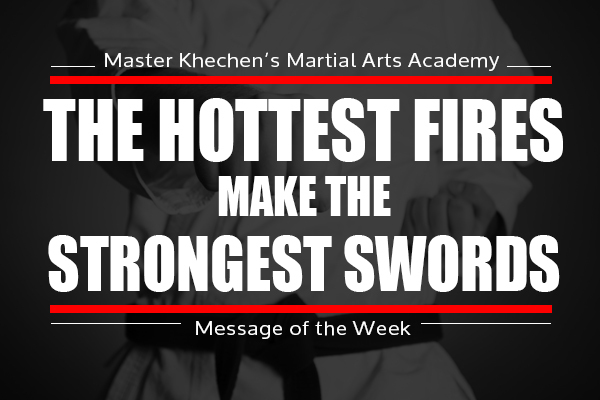 This repeated heating and folding of the steel gives the sword its strength. For us to get stronger, we have to go through a similar process. Except we find our fires by challenging ourselves and stepping out of our comfort zone. Our upcoming tournament is the perfect opportunity to get out of your comfort zone and turn up the heat on your training. By putting yourself under the pressure of competing you’re giving yourself the chance to become sharper and stronger, just like a samurai sword. But more importantly you’re giving yourself the chance to become more confident, so that when the next challenge in your life comes along you’ll know you can beat that, too!